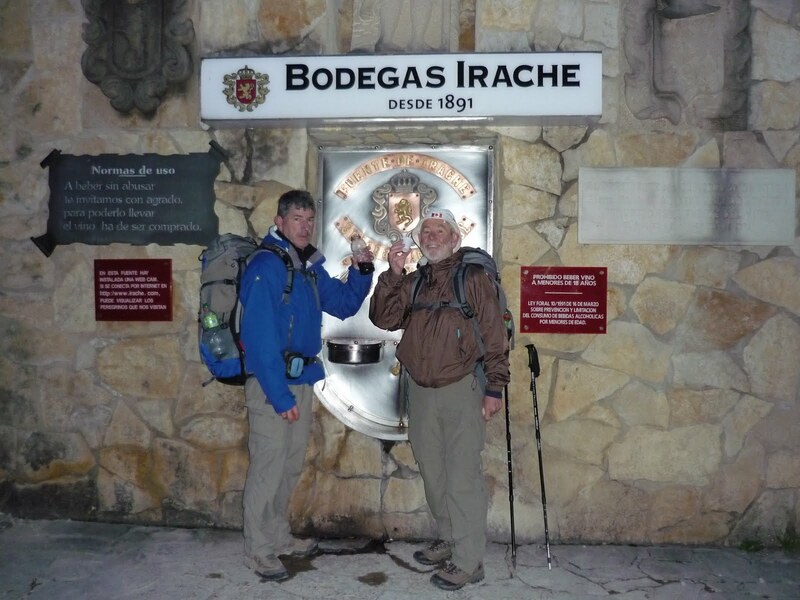 There´s never an easy day on the Camino. Some days are easier than others but none is easy and so one begins to give thanks for small blessings. The morning may be cool and you might need a fleece, jacket, gloves and hat but it´s better to wear the warm clothing than carry them and so that´s a blessing. That first morning climb may be steep and the breathing laboured but at least it´s not in a blizzard (like the Pyrenees), a much appreciated blessing. The descent may be dangerously steep but it´s a blessing that it´s not muddy today. The alberque may not be spacious and it may be crowded but at least we got a bed for the night - a blessing when you count the number of pilgrims who arrived too late only to find the alberque full for the night. The pilgrim´s menu may not be fine cuisine but it´s filling and that´s a blessing. The walk might have been too long today but thankfully it´s a walk without injuries, a blessing. The backpack might be heavy but it is what it is and by now everything in it is needed. Well, almost everything. I am so grateful for many of the things I brought and the choices I made in preparing my gear. Some of the things that have worked out great and which have been most appreciated might seem surprising. I´ve really made good use of the leggings and the extra light weight Under Armour tshirt I brought. None of the refugios are heated nor do they offer any sense of privacy so the leggings and tshirt have been great not only for warmth but so than I´m not running around in my underwear. My thin camisole and long sleeve tshirt have been great for layering for warmth. I may not look great at night after my lukewarm shower but I´m sure making use of the layered look. I´ve worn everything I brought except my hiking shorts and I´m sure they will not be superfluous later in the month when the weather gets warmer. My boots have been great although after 34kms my feet are hot and tired - but at least they are not blistered and so that´s a blessing. I couldn´t have done without two hiking sticks. The nylon backpack I brought has worked out great at night as I dump my camera, journal, money and passports, maps and glasses in it and then next morning the whole thing gets crammed into my big pack. My backpack has also been pretty good. It would be better if it weighed less but I can´t think of anything I´d leave behind except maybe one pair of socks and a couple of toiletries. And it´s nice to go to sleep at night with our pillows wrapped in our kids childhood pillowcases. Just a nice comforting reminder of our loved ones. Today, we went from Ayegui to Torres del Rio. 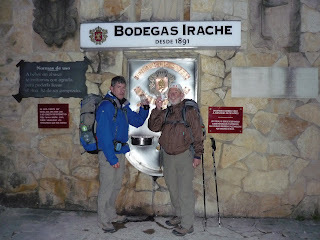 It was another quick predaylight start and within 20 minutes we were at the Fuente de Vino at the church in Irache. This is where there is a wine font right in the church wall. John and Dayton had the traditional drink of wine but I found 6:50am just a little early to be drinking so I filled my extra water bottle saving it for later. This morning´s walk was again along lovely dirt roads which, for the most part, were level. John and Dayton could really stride out. I managed to catch up with them every now and then by running on the downslopes. In Los Arcos we had another Camino moment when we found a great bar where the guys had café con leche and bocadillas which are Spanish sandwiches on big baguettes. One bocadillas was with tortillas patatas (like a scalloped potato/egg dish) and the other was with chorizo sausage. After Los Arcos, we came to Sansol which was a beautiful town at the top of a hill, which actually all towns seems to be - at the top of a hill. Then it was a steep descent into Torres del Rio. What a gem! We were fortunate to be among the first 6 to arrive, just like being in the Amazing Race. We were happy with our prize which was a bed for the night. Those who arrived later were out of luck. We had a great dinner at the local restaurant with the other 36 pilgrims.